I use it to make veggi chilli for my son - you have to think about what ingredients are in it to give it flavour as it has little flavour of it's own.Herbs/tomatoes/vegetable stock/spices etc. It's nice if you put the effort in. It can also be used to bulk out beef chilli making it a bit healthier and cheaper - most people wouldn't even notice it's there! 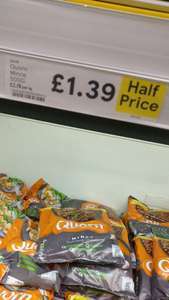 Has Quorn Mince changed over the years? I used to buy it around 25 years ago when it was first launched, but the last few times I've tried to cook with it, it was unpalatable. Either that or my tastebuds have changed! Yummy! Cheap! Better for the environment and healthier. Win win win Win!!! Mycoprotein - "protein derived from fungus". It's actually developed from a mould that ICI found in soil in Marlow in Buckinghamshire and is grown in big vats. Which they tend not to publicise and want people to just think of mushrooms. I use it to make veggi chilli for my son - you have to think about what …I use it to make veggi chilli for my son - you have to think about what ingredients are in it to give it flavour as it has little flavour of it's own.Herbs/tomatoes/vegetable stock/spices etc.It's nice if you put the effort in.It can also be used to bulk out beef chilli making it a bit healthier and cheaper - most people wouldn't even notice it's there! Tofu has no flavour on it's own either. Is there no vegetarian meat substitute that does have flavour?